The Communist Manifesto is the founding statement of the revolutionary socialist tradition. In it, Engels and Marx set out a political method that emphasizes capitalism's dynamism and volatility; the need to relate to the exploited and oppressed in the struggle for socialism; to differentiate revolutionary socialists from other political alternatives; and to inspire a struggle for a socially just and fully democratic world. In the following essay, we examine how Marx and Engels saw the evolution of the Manifesto and its various uses in the struggle against capitalism in the last 160 years. "All that is solid melts into air." This is how Karl Marx and Frederich Engels described the dynamism and volatility of capitalism in the Communist Manifesto. In the midst of the financial panic of October 2008, this description of capitalism’s nature, as the most dynamic mode of economic production in human history, in constantly revolutionizing economic productive forces and relations, and the most volatile – with an inbuilt tendency for the rate of profit to fall, and for economic crises to result in financial panics leading to disinvestment, deflation and mass unemployment, rings true once more. Whether financial state capitalism, by massive bailouts, Central Bank interest rate cuts, or nationalizing financial risk itself, can mitigate the current volatility remains to be seen. But what immediately strikes the reader of the Communist Manifesto today is that the reappearance of capitalist crisis at the heart of the market economy makes an examination of Marx and Engels' political conclusions in the Communist Manifesto, and the arguments and different conclusions of succeeding socialist generations in engaging the Communist Manifesto, worth re-examination. What this paper proposes to do, therefore, is examine what Marx and Engels argued for as a consequence of the historical materialist approach to capitalism; how they modified some of these conclusions as revealed in subsequent prefaces; how the next generation, as embodied in German Social Democracy, divided on the relation between, and ultimately the very question, of reform or revolution; how the Manifesto was taken in radically different directions in the aftermath of the Russian Revolution; and, finally, how the Manifesto plays a dual role in Western radical discourse, as a powerful critique of capitalism, but with populist and radical social democratic reform conclusions. Whatever the status of the Communist Manifesto today as a classic in the political canon of modern political thought, Marx and Engels wrote the Communist Manifesto for an eminently practical reason. The Manifesto was written to not just express a new, historical materialist analysis of industrial capitalism, but also to be used as a weapon of political struggle at the onset of the 1848 revolutionary crisis. As such, the Manifesto was intended to give shape to the rise of a new German working class movement, which, in alliance with the German bourgeoisie, would usher in an era of capitalist development, national unity, and republican politics – as the basis for a further working class led social revolution. As a political tool in the class struggle, this explains why the Manifesto was largely devoted to questions such as the relationship between Communists and workers, the need to clarify why competing ideas such as utopian socialism were not adequate to the revolutionary tasks of the moment and the future, and the non-sectarian attitude communists needed to take in working with other opponents of capitalism. The Manifesto, however, played a very modest role in the upheavals of 1848. The significance of the Manifesto afterwards came more in the vision of capitalism presented and the political lessons of the class struggle then and later. Thus, in the seven prefaces written by Marx and Engels, (mostly Engels), the Manifesto came to play a dual role – as a basic introduction to the ideas of historical materialism and as a place of political reflection for communist cadre based on the course of the latest revolutionary experience. In the first German preface of 1872, Marx and Engels made three points. First, the Manifesto was no longer an agitational document. The ten demands of 1848 had been bypassed by subsequent events. That is, the Manifesto was beginning to assume a historical character as a reflection of a particular moment in the class struggle. Secondly, Marx and Engels stood by the Manifesto as a true expression of the ‘general principles’ of historical materialism and communist political methods. Thirdly, as a modification of those political methods, the experience of the Paris Commune revealed a new truth – the proletariat could not simply lay their hands upon the existing state. This last statement can be read in two senses. 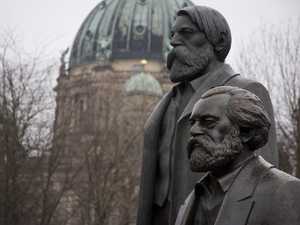 After the failure of the German Revolution of 1848, Marx and Engels drew a conclusion about the nature of making the social revolution and political alliances. The bourgeoisie, who had been looked to as a leadership in making the democratic revolution, were not to be relied upon. The workers would have to make both the democratic and social revolution. This folding of revolutionary tasks Marx and Engels described as ‘the revolution in permanence’. As well, a new workers’ state, like the Paris Commune, would have to be created as the vehicle for these tasks. In 1882 in the Preface to the Russian edition, Marx and Engels recognized a new circumstance in the class struggle, its growing global character. Now modern capitalism had spread to the great powers of Russia and the United States. Marx and Engels also speculated as to whether pre-capitalist forms of social organization could act as a platform for a transition to socialism, as in the case of the Russian peasant commune. This was not to be but it indicated a new attention to the political challenge of applying revolutionary socialist ideas and organization to the combined and uneven development circumstances of capitalism on a world scale as it encountered previous modes of production, and different levels of capitalist development. In the third, German, Preface of 1883, Engels registered the fact of Marx’s passing and underscored the importance of the Manifesto as an educational document, as an introduction to the basic components of historical materialism. Engels also emphasized the broad burden of leadership the proletariat bore as the emancipators of all of society. Then, in 1888, the famous Samuel Morehouse translation was developed for the English-speaking world. Here Engels was concerned to explain to English readers, without a continental background, what the circumstances had been in the creation and evolution of the Manifesto, the materialist conception of history, and why the term Communism had been used to differentiate themselves from other reform or Socialist' currents of the 1840s. In 1890, Engels wrote another preface for German workers stressing the growth of German class struggles, as in trade union organization and the demand for an eight hour day. While Engels’ tone is optimistic, in a context where German Social Democracy (SDP) had become the world’s largest proletarian party, this preface was written also with an eye to committing the SDP to full Marxist principles with the adoption of the Erfurt Program in 1891. While Marx and Engels were prepared to amend some of their political conclusions from 1848, as based on the experiences of 1848-51 and the Paris Commune in 1871 (to argue for even more militant conclusions), they clearly saw the Manifesto as having permanent value as an introduction to historical materialism and as an expression of the political commitment of a workers’ class struggle for a social revolution. But in the conditions of capitalist boom and working class reforms before 1914, many social democrats questioned this revolutionary or ‘catastrophist’ perspective. In the lead was Eduard Bernstein with a critique of the Manifesto. Bernstein even went so far as to explicitly identify social democracy with the liberal imperialist theory of Europe’s mission to civilize the world. This included a defence of German imperialist interests like its Chinese Shandong (Kiauchow Bay) concession. As Bernstein famously said, given this new and permanent world of reformist possibilities, the final aim is nothing and the movement is everything. Bernstein’s (and Vandervelde’s) explicit recognition of social democracy’s reformist agenda and practice, with a clear theoretical break from the main political conclusions of the Communist Manifesto – that history was driven by class struggle and that workers have to smash the old state system to lay the basis for a social revolution in the interests of the majority – outraged Marxist theorists. In particular a number of leading SDP members responded, Parvus (Alexander Helphand), Rosa Luxemburg, and Karl Kautsky. Parvus wrote a series of articles, "Bernstein’s Overthrow of Socialism", to immediately condemn Bernstein’s economic analysis and to argue that breaking with the final goal of proletarian revolution was to abandon socialism itself.6 Rosa Luxemburg in her classic Reform or Revolution? challenged Bernstein, and supporters like Vandervelde, on four grounds: lack of theory; denying capitalist crisis; omitting a class theory of the state; and not understanding the relationship between reform struggles and the final goal of social revolution. First, Luxemburg argued that Bernstein’s ‘amendment’ of Marx was not an amendment but a departure from historical materialism itself to regress into an earlier form of petit bourgeois socialism (in the name of Marx). Secondly, Bernstein was simply wrong on the nature and facts about credit and cartels in stabilizing capitalism. There were a number of financial crises in the early 1890s, 1900, and especially in 1907. As well, the persistence of small property in some economic sectors and the rise of a new, salaried middle class did not nullify the tendency to concentration and centralization by large capitals. In fact, these concentrated forms of organization deepened the tendencies to inter-state competition by tariffs and militarism. Thirdly, in a profoundly challenging way, Luxemburg argued that the extension of bourgeois democracy, while an important tool for workers in the class struggle, was an expression of capitalism’s need to more thoroughly integrate nations behind capitalist causes. Indeed, even state ownership was an expression of capitalist needs to socialize the costs of accumulation. The dictatorship of the bourgeoisie operated in both realms, economy and state. Karl Kautsky, editor of the SDP’s leading theoretical journal, NeueZeit, condemned Bernstein’s break from the Manifesto with his introduction to the seventh German edition in 1902 (and his book Social Revolution). Here Kautsky took on Vandervelde’s economic questions to convincingly show that Marx and Engels were not proponents of the iron law of wages (i.e., immiseration), that workers could see a relative increase in their standard of living while exploitation and instability could also increase. And Kautsky reinforced Parvus and Luxemburg’s finding about the persistence and necessity of capitalist crisis.8 However, as Lenin pointed out later in State and Revolution, Kautsky did not address Bernstein’s assertion about the ameliorating effects of parliamentary activity on the class struggle.9 Indeed, Kautsky would break with the Manifesto and repudiate the dictatorship of the proletariat in 1918. The Russian Revolution revived the Communist Manifesto as a living political document in preparing for the October Revolution, in the launch of the Third International (the Comintern), and in the debate between Stalin and Trotsky over command methods in the building of socialism. While the Russians had condemned Bernstein’s break from Marx’s ideas and methods, with Plekhanov and Lenin criticizing the reformists’ adaptation to a period of capitalist boom13, the Manifesto became a major source of authority in launching the October Revolution. Once the Soviet regime was consolidated and stabilized, however, the Communist Manifesto became a battleground in the struggle between Stalin and Trotsky. To begin with the Communist Manifesto entered into its most popular era, as Lenin described it, as ‘a basic handbook of communism’. The USSR’s Foreign Languages Publisher turned the Communist Manifesto into the second most published book on the planet. Trotsky, upon the 90th anniversary of the Communist Manifesto penned a very different appreciation. Trotsky emphasized three concerns: where the document had become historically dated, where the ideas of historical materialism retained their full force, and where some modification or alteration was necessary. By and large Trotsky argued the Manifesto had stood up remarkably well to the passage of time. The materialist conception of history, the primacy of the class struggle, as opposed to class conciliation (often on the grounds of national unity within the left), the anatomy of capitalism (including the tendencies to crisis and absolute immiseration in the Depression), the class nature of the state (with the tasks to smash the old state and construct a democratic dictatorship of the proletariat where the state will wither away), and the international character of the proletarian revolution across the spectrum of ‘civilization’ all were still valid. As well, Trotsky stressed the methodological value of the Communist League’s Ten Demands as a bridge between general theory and the tasks of the moment. Since 1991, with the end of the Cold War and the revival of popular anti-capitalist sentiment, however, the Communist Manifesto is being re-examined as to whether it can be a living guide once more. In a very broad sense, the appearance of an anti-capitalist movement since the 1999 protests in Seattle against the Work Bank and the International Monetary Fund; the World Social Forum process as an ongoing platform to protest the consequences of neo-liberal capitalism; and the widely popular writing of Canadian journalist-social activist Naomi Klein – in getting youth to question how big business works through market branding and educating a new audience about the deliberate shock tactics of neo-liberalism in causing more poverty and chaos to build trickle-down economies24, have all served to create an atmosphere where it is possible to discuss Marx before audiences in ways denied during Cold War polarization. Even in the academic realm, there has been a re-examination of Marx’s relevance to the post-1991 neo-liberal globalized order. While more traditional voices, like Eric Hobsbawm, Gareth Stedman Jones, and John Toewes continue to focus on the political break of Stalinism with revolutionary socialist ideas, in effect walling off Marx and the Manifesto as a living political resource25, other scholars like Ellen Meisksins Wood, in her introduction to the Monthly Review Press edition, once more questions the rationality of capitalism and points to the constructive role class struggle can have in overcoming the irrationality of the market place.26 This is a remarkable change from two generations of academic dismissal and/or pessimism. However, having said there is a much more open milieu in which to discuss Marx and the Manifesto, two caveats need to be noted. A new Cold War atmosphere has been fostered since the terrorist attacks of 9/11 in the United States in an effort to close off the anti-capitalist space. But the length and contradictions of the retaliatory wars in Iraq and Afghanistan have diminished the power of imperial nationalism. The sub-prime mortgage crisis, with neo-liberal governments having to use aggressive state capitalist strategies of nationalization, also puts in question the pro-market ideology that has ruled much of public discourse in the west for the last generation. Perhaps more importantly, while many new forces are willing to consider Marx’s critique of capitalism, there is much ignorance and reservations about whether Marx’s political solutions have any relevance. Can the working class be a force for positive change, and is there a legitimate political tradition of democratic transformative change based on working class self-emancipation and self rule? Any honest assessment of the anti-capitalist movement today has to acknowledge that social reform, not social revolution, is dominant. But the Communist Manifesto, and the debates and experience of applying it in the class struggle, stand as a resource if regulation is not possible. 1For the text of all seven prefaces see Karl Marx and Frederick Engels, The Communist Manifesto, with an introduction by A.J.P. Taylor, Harmondsworth, England: Penguin, 1967. For a bibliographical history of the Manifesto see H. Draper, The Adventures of the Communist Manifesto, Berkeley, California: Center for Socialist History, 1994. 2See the introduction to H. Tudor and J.M. Tudor, editors, Marxism and Social Democracy: The Revisionist Debate, 1896-1898, Cambridge, U.K.: Cambridge University Press, 1988. 3E. Bernstein, Evolutionary Socialism, New York: Schocken, 1961 (Originally 1899), x. 5Ian Thatcher, "Past Receptions of the Communist Manifesto" in M. Cowling, editor, The Communist Manifesto: New Interpretations, New York: New York University Press, 1998, 65-66. 6Tudors, Marxism and Social Democracy, 174-204. 7Rosa Luxemburg, Reform or Revolution, with an introduction by D. Gluckstein, London: Bookmarks, 1989. 8Tudors, Marxism and Social Democracy, see Introduction. 9R.C. Tucker, editor, The Lenin Anthology, New York, W.W. Norton and Company, 1975, 387-388. 10F.L. Bender, editor, Karl Marx, The Communist Manifesto, New York: W.W. Norton and Company, 1988. For Kautsky, see pages 127-131 and Adler, pages 136-138. 11H. Laski, Karl Marx: An Essay, London: George Allen and Unwin, 1949 (original edition 1925). 15A. Alder, editor, Theses, Resolutions and Manifestos of the First Four Congresses of the Third International, London: Ink Links, 1980, 27-36. 16See D. Ryazonoff, editor, The Communist Manifesto of Karl Marx and Frederick Engels, New York: Russell and Russell Inc., 1963 (originally 1930). Ryazonoff’s historical materials were developed as a set of lectures for Sverdlov University in 1919-1920 and at the Socialist Academy, 1921-1922 for a course on the Communist Manifesto. For an even more thorough historical description see D. Struik, Birth of the Communist Manifesto, New York: International Publishers, 1971. 17V. Adoratsky, The History of the Communist Manifesto, New York: International Publishers, 1938. 18G. Obichkin, On the Manifesto of the Communist Party of Marx and Engels, Moscow: Foreign Languages Publishing House, 1955. 19P. Sweezy and Leo Huberman, The Communist Manifesto After 100 Years, New York: Montly Review Press, 1949. 20Leon Trotsky, 90 Years of the Communist Manifesto, New York: Pathfinder Press, 1987 (originally 1938). 21See A.J.P. Taylor’s 1967 introduction or Gareth Stedman Jones 2002 introduction for examples. The Communist Manifesto by Karl Marx and Frederick Engels with an introduction and notes by Gareth Stedman Jones, London: Penguin, 2002. 23For examples see: P. Karat, editor, A World to Win: Essays on the Communist Manifesto, New Delhi: Leftword Books, 1999 and A. Pinto and S. Chakraborty, The Relevance of the Communist Manifesto, New Delhi: Indian Social Institute, 2000. 24See N. Klein, No Logo: Taking Aim at the Brand Bullies, Toronto: Knopf Canada, 2000 and The Shock Doctrine: The Rise of Disaster Capitalism, New York: Henry Holt and Company, 2007. 25See Eric Hobsbawm, editor, The Communist Manifesto, London: Verso, 1998, Gareth Stedman Jones, editor, The Communist Manifesto, London: Penguin, 2002, and John Toews, editors, The Communist Manifesto (Student Edition), Boston: Bedford Press, 1999. While Hobsbawm and Stedman Jones do acknowledge the possibility of a post-capitalist future, Toews revives Bernstein’s arguments with a remarkable fidelity. Populism: An Adjective or a Noun? Material on this Web site is licensed by socialistsolidarity.ca, under a Creative Commons (by-nc-nd 3.0) license, except for articles that are republished with permission. Readers are welcome to share and use material belonging to this site for non-commercial purposes, as long as they are attributed to the author and socialistsolidarity.ca.